The 11th annual golf tournament for the Juvenile Diabetes Research Foundation. Over the last 10 years, Paragon has donated over $110,000 to JDRF! Our staff, clients, and business associates have walked with us through this journey of helping to find a cure for Juvenile Diabetes. 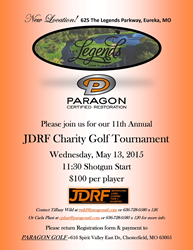 Paragon Certified Restoration will be hosting its 11th annual golf tournament on May 13th, 2015, at 625 The Legends Golf Club in Eureka, Missouri for Juvenile Diabetes Research Foundation (JDRF) to raise money for research for a cure to diabetes. The Shotgun start begins at 11:30 a.m.
JDRF focuses on one single goal to accelerate their research progress to cure diabetes and its complications. JDRF had spent more money for diabetes research than any other charitable organization. Paragon Certified Restoration is asking for help from donors by hole sponsors, tournament sponsors, silent auction prizes, goodie bag giveaways and raffle ticket items, sport memorabilia, sporting event tickets, shirts, hats, jackets, golf balls, golf goodies, and/or local business coupons. Carla Plant will pick up any contributions that could be donated and she may be reached at (636) 728-0580 x 120 or email cplant@paragonstl.com. Paragon Certified Restoration is a full service fire and water restoration located in St. Louis, Missouri, Columbia, Missouri, and Swansea, Illinois that specialized in insurance related property damage repair. They are available 24 hours, 7 days a week and can repair any building or home like or even better than new! Visit them online to get a full glimpse of what they offer and to read some great informational blogs about protecting the home from outside or inside forces at http://www.paragonstl.com/.